In case anyone is having the issue of having the program installed but not seeing the voice option in the voice packs, for some reason this doesnt auto enable when you install it (at least it didnt for me) and youll have to go into your addons and enable it. 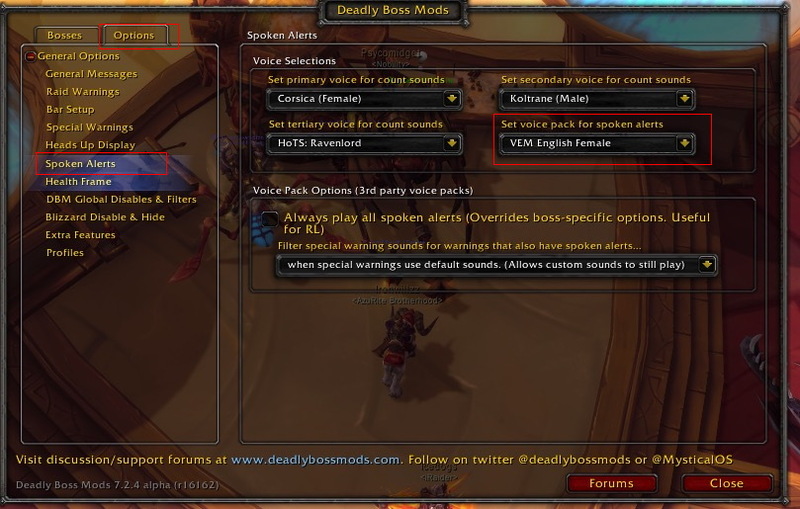 I'm getting a warning that this voice pack ins missing some sounds and that the addon is using the default ones now. Same here. Anyone know what is going on or how to fix it? Exactly how is this voicepack suppose to work? Is the VEM English Female just suppose to count down? The real VEM announced the next ability along with a count-down. what happened to the Overwatch voices? probably ask in dbm comments. we no longer take care of the logic parts. Is this Voicepack updated for Legion? Do you plan on updating this for Legion? Any chance an update is coming soon? I would like to know if there is a way to add the countdown from the announcers of Mortal Kombat in there? If you would like I have the files and I am willing to share them with you. Isn't there a way to preload the assets before gameplay. It hangs the game for moments on old HDDs when it tried to pick the files from disk during a fight. That's normal behavior if an asset is not preloaded on any game. On the Iskar encounter in Hellfire Citadel, the "VEM English Female" keeps saying something that sounds to me like "torn posts". Other people in my raid group who use the voicepack heard the same thing; one said maybe its "tauren bots", which makes no sense either. This happened on both LFR and heroic versions of the Iskar fight (I have not attempted normal). I have no idea what this is supposed to mean. Can someone clue me how to parse what is actually being said? On other fights it says more intelligible things like "interrupt" or "switch tanks". Thank you. edit: Its the same in Tyrant as well, "torn posts" and nothing else. I think it's saying "taunt boss"